Showing at the Puerta Vallarta Film Festival 2009 (Dec 2 - Dec 4), The Donner Party, a part of California's history has been played out on the big screen. Film goers are in for a definite treat! Written and directed by TJ Martin and stars Crispin Glover ("Beowulf" and "Back to the Future") as William Foster, Clayne Crawford ("Wristcutters: A Love Story") as William Eddy, and Catherine Black ("American Psycho") as Ann Fosdick. 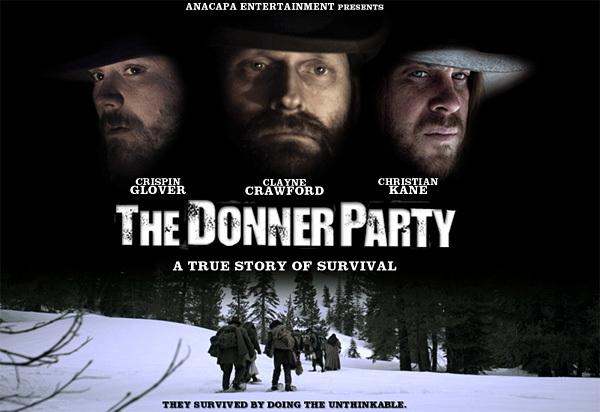 Entered in the festival under the Dark Matters category, “The Donner Party” is based on the true story of a group of westward bound settlers stranded in the Sierra Nevada Mountains in 1846. They must reach California for salvation, but without food and a guide, the group becomes disillusioned and decisions must be made so that others can stay alive. Inspired by the infamous Donner Party tragedy, the film is a harrowing look at survival and how far some will go to achieve it. Traveling from Illinois to California, this famed wagon train reached the Sierra Nevada at the end of October 1845, only to encounter a massive snowstorm.. Demoralized and low on supplies, about three quarters of the party elected to camped at a lake (now called Donner Lake), while the other families camped about six miles away, in the Alder Creek Valley. Slaughtering their oxen for food, they battled to stay alive. However, conditions continued to worsen and by mid-December, ten men and five women made snowshoes and set out for Sutter's Fortto find help. Caught in a raging blizzard, four of the party died. The survivors resorted to cannibalism, then continued on their journey; three more died and were also cannibalized. Close to death, two men, and all five of the women—finally reached safety on the western side of the mountains on January 18, 1847. Playing the role of newly-married Ann Fosdick, Canadian actress Catherine Black is one of the few who make it out alive. Not only does she suffer the trials and tribulations of the horrific journey, but she also suffers the loss of her husband and her father along the way. “It was such an honor to have the opportunity to not only work on The Donner Party, but also to play Ann Fosdick, says Black. “Once I began reading about Ann and all of The Donner Party,, I became obsessed. I read all the journals and everything I could about what was happening in America in the 1840's. The struggles, the excitement and the expansiveness of that time period in America was illuminating to me and to what it means to be North American. I gained a greater understanding and appreciation for my own forefathers, and for anyone who is brave enough to leave what is comfortable and search and expand for more. Hailing from Toronto, Black has been acting for the past ten years. In addition to her amazing talent in front of the camera, she is also an extremely accomplished artist. A very simple, earthy, passionate, easy going and fun person, Black made her stage debut at the age of 16 as "Juliet" in Shakespeare's Romeo and Juliet. She has stared in several Dora Award winning productions such as Walls of Africa, Crimes and The Human Zoo. On the big screen, Black has acted opposite Christian Bale in American Psycho and has worked with director Amy Heckerling in Loser. Television credits include co-starring in the ABC/Disney MOW Mr. Headmistress. Select television credits include, Show Me Yours (Showcase), I Love a Mummy (YTV), Blue Murder (Global TV) In a Heartbeat (Disney/Family) and Odyssey 5 (Showtime).